Michael II and his son Theophilos, beginners of the Amorian dynasty. Michael II the Amorian (Greek: Μιχαήλ Β', Mikhaēl II ), also called Traulos or Psellos (Τραυλός, Ψηλλος, Latin Psellus), meaning "the Stammerer", reigned as Byzantine emperor from 820 to his death on October 2, 829. Born in Amorion in Phrygia, he began his career as a private soldier, but rose by his talents and by his marriage to the theme commander's daughter Thekla to the rank of general. Together with the future Emperor Leo V the Armenian, he served the rebel general Bardanes Tourkos but deserted him in favor of Emperor Nikephoros I in 803. Michael was promoted when Leo V became emperor in 813, but was suspected for conspiracy, jailed and sentenced to death in December 820; his partisans, however, freed Michael, who organized the assassination of Leo V during Christmas mass in Hagia Sophia. 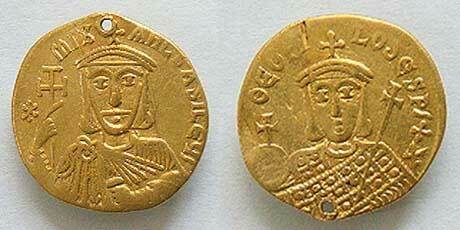 Michael II was now proclaimed emperor and was crowned by Patriarch Theodotos I of Constantinople later the same day. In his internal policy, Michael II supported Iconoclasm, but tacitly encouraged reconciliation with the iconodules, whom he generally stopped persecuting and allowed to return from exile. These included the former Patriarch Nikephoros and Theodore of Stoudios, who failed, however, to influence the emperor to abandon Iconoclasm. One of the few victims of the emperor's policy was the future patriarch Methodios I.
Bulgarian king Omurtag sends delegation to Byzantine emperor Michael II, from the Madrid copy of the Chronicle of John Skylitzes. At this point Omurtag of Bulgaria came to the aid of Michael II and forced Thomas to lift his siege of Constantinople in spring 823. Besieged in Arkadioupolis (Lüleburgaz), Thomas was surrendered to the emperor in October and executed. In spite of weathering the storm, Michael found the defenses of the empire seriously weakened, and was unable to prevent the conquest of Crete by the Arabs in 824, or to recover the island with an expedition in 826. In 827 the Arabs also invaded Sicily, taking advantage of local infighting, and besieged Syracuse. By 829 their invasion had failed and they were expelled from the island. After the death of Thekla, in c. 823 Michael II married Euphrosyne, the daughter of Constantine VI This marriage was probably intended to strengthen Michael's position as emperor, but it incurred the opposition of the clergy, as Euphrosyne had previously become a nun. Michael II died on October 2, 829. Theophilos, who succeeded as emperor.